Before :- Dilip Kumar Seth & Joytosh Banerjee, JJ. For the Appellant :- Sudhis Dasgupta, Harish Tandon, Subhasish Pachhal, Goutam Das, Advocates. For the Respondent :- Haradhan Banerjee, Subrata Roy Karmakar, Nani Gopal Chakraborty, Advocates. Vijaykumar Ramchandra Bhate v. Neela Vijaykumar Bhate, 2003(6) SCC 334. Juwarsingh s/o Bheraji v. State of Madhya Pradesh, 1980 (Supp) SCC 417. Green View Tea & Industries v. Collector, Golaghat, Assam, 2004(4) SCC 112. Srinivasiah v. Balaji Krishna Hardware Stores, AIR 1999 SC 462. Moran Mar Basselios Catholicos v. Most Rev. Mar Poulose Athanasius, AIR 1954 SC 526. Benoy Krishna Rohatgi v. Surajbali Misra, AIR 1963 Cal 100. Krishna Sarbadhikary v. Alok Ranjan Sarbadhikary, AIR 1985 Cal 431. Parison Devi v. Sumitri Deui, 1997 (8) SCC 715. S. Nagaraj v. State of Karnataka, 1993 Supp (4) SCC 595, at 630. The appellant has filed this application for review of the judgment and decree dated 25th of April, 2003 in FA No. 12 of 2001. Mr. Dasgupta in support of the review application had contended that the Court had overlooked the materials apparent on the face of the record to the extent that the wife had made false and wild disparaging allegations against the spouse, which amounts to cruelty. In support, he relied on Vjaykumar Ramchandra Bhate v. Neela Vijaykumar Bhate, 2003(6) SCC 334. He then points out that the learned Court in the judgment had disbelieved the evidence of the appellant/husband and believed that of the wife on the ground that there was no cross-examination on certain points. Mr. Dasgupta contended that absence of cross-examination does not mean that the evidence was unchallenged. To support this contention, he relied on the decisions in Juwarsingh s/o Bheraji & Ors. v. State of Madhya Pradesh, 1980 (Supp) SCC 417 and P. Ram Reddy & Ors. v. Land Acquisition Officer, Hyderabad Urban Development Authority, Hyderabad & Ors., 1995(2) SCC 305. Thus the finding arrived at suffers from errors apparent on the face of the record. He next contended with regard to the question of cohabitation, particularly, at page 7 of the judgment under review and drew our attention that the evidence itself was unreliable and as such the absence of cross- examination would not matter. Inasmuch as Mr. Dasgupta pointed out that the wife admitted of not living in the same room and cohabitation was alleged four months after the filing of the suit. It is the probability of the evidence and the credibility of the witness, which are to be considered not the absence of cross-examination. Even in the absence of cross-examination, the evidence is to be weighed with its value without attaching much importance on the absence of cross-examination. On the question of review, Mr. Dasgupta relied on the decisions in Green View Tea & Industries v. Collector, Golaghat, Assam & Anr., 2004(4) SCC 112 (para-14); Srinivasiah v. Balaji Krishna Hardware Stores, AIR 1999 SC 462 (paras 8, 9); Moran Mar Basselios Catholicos & Anr. v. Most Rev. Mar Poulose Athanasius & Ors., AIR 1954 SC 526 and Benoy Krishna Rohatgi & Ors. v. Surajbali Misra & Anr., AIR 1963 Cal 100 (paras 3 to 13), in order to support his contention that this is a case fit for review. Mr. Dasgupta drew our attention to the various materials on record to substantiate his contention. Virtually he had re-argued the whole appeal. 2. Mr. Haradhan Banerjee, learned Counsel for the respondent/opposite party, on the other hand, took a preliminary objection that the review does not lie if the decision is erroneous. According to him, when two views are possible, acceptance of one view cannot be a ground for review. The judgment proceeds on the basis of the question of belief and disbelief, which can never form the subject-matter of review. On the question of cohabitation, he drew our attention to pages 8 to 10 of the judgment under review. Mr. Banerjee then contends that the filing of the case under Section 498A of the Indian Penal Code (IPC) would not amount to cruelty since the cruelty stands condoned unless the allegations are renewed or repeated. Mr. Banerjee, however, distinguishes the decision in Moran Mar Basselios Catholicos (supra) on the ground that in the said decision, the question was not attended; whereas in the present case the question was adverted to. He drew our attention to page 17 of the said judgment. He further points out that the cohabitation had revived the matrimonial relation and amounts to condonation. He relied on Krishna Sarbadhikary v. Alok Ranjan Sarbadhikary, AIR 1985 Cal 431 at page 440, to enunciate the ground when the matrimonial offence can be revived. Relying on this decision, he contended that in this case there was no material to show that the matrimonial offence was revived to attract the principles of cruelty on account of pendency or survival of the proceedings under Section 498A IPC. He also relied, for the same proposition, on the decision in Parison Devi & Ors. v. Sumitri Deui & Ors., 1997(8) SCC 715 (paras-9, 10). He then contended that there is nothing to indicate that what documentary evidence was not considered. On this ground Mr. Banerjee submits that the review application should be dismissed. 3. We have occasion to hear the matter for days together. Both the learned Counsel continued to elaborate their submissions from various angles. The matter was hotly contested. Both the learned Counsel had referred to the pleadings and the evidence as well as exhibits in relation to the merit of the case. In the process of the elaborate argument, both the learned Counsel had argued the whole appeal in order to substantiate the case for review. Both the learned Counsel suggested that they may be permitted to argue on both the counts and the Court may pass a composite order, namely an order disposing of the review application and in case the review is allowed to dispose of the appeal upon re-hearing in the same process. Accordingly, both the Counsel had addressed the Court. Having regard to the submissions made by the learned Counsel as above, we agreed to the suggestion and heard the application for review and the appeal simultaneously. In these circumstances, by consent of parties, we propose to dispose of the review application along with the appeal. RVW No. 425 of 2004. Justice is the end of Government. It is the end of the civil society. It ever has been and ever will be pursued, until it be obtained or until liberty be lost in the pursuit. In Srinivasiah (supra), it was held that an assumption that appears to be incorrect on the basis of the materials would be a sufficient ground for entertaining review. 5. 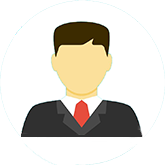 The principle of review is settled proposition of law. It does not require elicitation of any principle or decision. Now, therefore, we may examine the ground agitated by Mr. Dasgupta. On the face of the record, it appears that the wife had initiated a proceeding under Section 498A read with Section 342 of the Indian Penal Code (IPC) being Complaint Case No. 1628 C/1991 (Ext. 10-11) before the learned Chief Judicial Magistrate, Howrah. The husband filed a criminal revision case being Criminal Revision Case No. 403 of 1992 before this High Court for quashing the said proceeding under Section 498A IPC. At the intervention of the lawyers of the parties, the wife was brought back on the assurance that she would withdraw the criminal case under Section 498A IPC. It is not in dispute that the said proceeding under Section 498A IPC has not been withdrawn by the wife and has since been kept pending, though, however, the wife did not take any further steps in the said proceedings. This fact admittedly is on record and was not considered by this Court in the judgment and order under review. This ground would be sufficient to review the order if it is held that the failure of withdrawal of this complaint under Section 498A IPC would amount to cruelty. 6. Since the wife did not take any further steps, it seems and may be presumed that the allegations made against her husband were false. The making of false allegation against the spouse amounts to cruelty as was held in Vjaykumar Ramchandra Bhate (supra). The allegation under Section 498A IPC against a spouse is disgusting accusation. In the said decision, it was held that subsequent deletion or amendment of the pleadings would not absolve from treating the wife by the husband with cruelty by making earlier injurious reproaches and statements. The impact whereof continued to remain on record, as in the present case where the allegations are still on record and have not been withdrawn, though not proceeded with. This making of false allegationin itself is a cruelty and then the cruelty is further fueled by reason of keeping the allegations under Section 498A IPC alive and surviving despite having agreed to withdraw the same, by reason of non-withdrawal thereof till date. 7. Admittedly, the judgment under review had proceeded to believe the evidence of the wife on account of absence of cross-examination on the question of cohabitation. Absence of cross-examination does not mean that the evidence is unchallenged. In Juwarsingh (supra), the Apex Court had held that the cross-examination is not the only method of discrediting a witness. If the oral testimony of certain witnesses is contrary to proved facts, their evidence might well be discarded on that ground. If their testimony is on the face of it unacceptable, Courts are not bound to accept the testimony merely because there was no cross-examination. Similar view was taken in P. Ram Reddy (supra) where it was held that the Court is not bound to accept the statement of a witness simply because there was no cross-examination of that witness. The truth of the evidence is to be tested on the basis of the probabilities and reliability. In the present case, there is evidence to show that the husband and wife were not residing in the same room since before institution of the suit. The allegation of cohabitation bears a date four months after the institution of the suit. This seems to be against all probabilities where the husband and wife are locked in the legal battle for the custody of the children and have been residing separately since before institution of the suit. This seems to be against all probabilities, which appears to have been overlooked. Our attention was drawn to the various contradictions and inconsistencies in the deposition of the wife affecting the credibility of the witness and reliability of the evidence given by her. 8. Even if we may not give credence to the question of cohabitation, but the very fact that the complaint under Section 498A IPC lodged by the wife has still being kept alive and surviving containing certain allegations which have not been proved, in itself is a sufficient ground to hold that there was cruelty at the time of institution of the suit and on account of its continuance till the decree and the decision under review and even today, containing various disgusting allegations against the husband generating a perception of being proceeded against him creating a disturbing effect in the mind of the husband. This is a ground sufficient to allow the review application. 9. It is true, as contended by Mr. Banerjee that an erroneous decision cannot be reviewed; when two views are possible, acceptance of one view cannot be revised; question of belief and disbelief cannot be intervened in a review. In this case the decision may be erroneous. But this erroneous decision was based on an error apparent on the face of the record in considering the existence of the question of cruelty on account of survival of the complaint under Section 498A IPC. The question of condonation of cruelty as contended by Mr. Banerjee does not find any support from the materials on record that the husband had ever condoned the cruelty. As soon the suit is filed on the ground of cruelty, there is no question of condonation of cruelty. The very pendency and survival of the complaint case under Section 498A IPC till the decision under review itself is a cruelty surviving which need no revival by fresh complaint or otherwise. Despite being agreed but the same having not been withdrawn, the wife's failure to withdraw the same itself revives the cruelty continuous until withdrawn. It is admitted that this complaint has not been withdrawn till today. Therefore, the principle of condonation of cruelty as was sought to be urged by Mr. Banerjee does not find any support from the materials on record. Therefore, the decision laid down in Krishna Sarbadhikary (supra) cited by Mr. Banerjee has no manner of application in the present case. 10. Thus, we find that the omission to consider the impact of the survival of the proceedings under Section 498A IPC supporting the ground of cruelty had escaped our notice and that on the question of cohabitation, there were certain cross-examinations and that the evidence of the wife could not be sustained on its own strength and that the husband had repudiated in his evidence and the suggestions of the alleged cohabitation. These are definitely errors or mistakes apparent on the face of the record and are sufficient grounds to review the judgment. 11. The facts apparent from record, viz : that the marriage has irretrievably broken and cannot be bridged between the parties and that the parties did not and cannot live together and that there is existence of cruelty on account of survival and/or pendency of the case under Section 498A IPC, having escaped our notice, are sufficient for allowing this application for review. 12. Accordingly, the application for review succeeds and is allowed, the judgment and decree passed by this Court, sought to be reviewed in this review application, is hereby set aside. The application for review is, thus, allowed. The appeal is restored to its original file and number and be re- heard. 13. By consent of parties, we have re-heard the appeal simultaneously with the hearing of the application of review of the judgment and decree. Both the learned Counsel argued the case elaborately and in detail and took us through the materials on record. After having re-heard the appeal by treating the same, by consent of parties as on the list for hearing of the appeal, now we propose to decide the appeal in the manner following. "started to neglect your complainant and also started torturing both physically and mentally during her stay at the house of the accused. 3. That the accused used to take wine regularly and almost everyday being intoxicated the accused tortured the complainant both physically and mentally and became a regular incident. The accused even had illegal relation with other ladies and used to meet other ladies frequently and without any hesitation. 4. That the brothers of the accused person are also of the same nature of the accused and also torture your complainant both physically and mentally and with the connivance of the accused the brothers of the accused tried to outrage the modesty of the complainant by force and if your complainant told anything about such behaviour of the brothers of the accused the accused used to reply to bear the matter. 5. That in spite of such torture both physical and mental your petitioner stayed with the accused and two children namely 1. Kumari Bidisha Chakrahorty, 2. Sri Humpi Chakraborty born out of (in) the said wed lock. 6. That your complainant tried her level best to stay at the house of the accused but such torture became higher and higher and the accused and his brothers almost regularly tortured your complainant both physically and mentally. 7. The accused also refused and neglected to give the daily meals and clothing to your complainant intentionally and willfully and the two children also never received any love and affection from the accused person on the other hand the accused used to behave very rough and even merciless to the said two children. 8. That in spite of such behaviour and torture of the accused and his other brothers, your complainant accommodated at the said house but when the torture of the accused and his brothers became intolerable by human being and also for the fear of life of your complainant and also for the safety, security and also for future other two children your petitioner was compelled to leave the house of the accused person along with her two children on 4.10.91 and since then your complainant is residing at the house of her sister. 9. That from the date when your complainant left the house of the accused neither came to see your complainant and her two children nor took any information till date. 10. That suddenly on 4.12.91 the accused along with some persons who identified themselves as police persons carne to the house of your complainant and have taken away the said two children of your complainant in a very rough and inhuman manner and your complainant informed the matter before Bally P.S. vide G.D. Entry No. 370 dt. 4.12.91. 15. This allegation was supported by the wife in her examination-in-chief (PB-I, p. 135) namely "It is correct to say that in December, 1991, I filed a case against my husband under Section 498A of IPC as my husband used to assault me very often." In her cross-examination (PB-I, p. 138), she said "I admit herein that all statements made in my application under Section 498A IPC and also in my application for recovery of my children in Criminal Courts are all correct and true." She further said in her cross-examination (PB-I, p. 139) that "I filed a case under Section 498A IPC against my husband for which my husband submitted an application in the High Court for quashing the said proceeding under Section 498A of IPC and that proceeding is still pending in the Hon'ble High Court. It is correct to say that there is in fact no petition of compromise of 498A IPC in between myself and my husband." At page 141 (PB- I) in her cross-examination she stated, "Fact that I filed a criminal case under Section 498A IPC against my husband. My lawyer drafted the petition and designed it according to his estimation under Section 498A IPC. I shall not examine that lawyer. Of late I have come to know that my case under Section 498A IPC against my husband is now alive." 16. It appears that these disparaging and disgusting allegations were made and were supported even at the time of examination-in-chief and cross- examination of the wife. Whereas at page 136 (PB-I) in her examination-in- chief, she said, "After compromise in the Hon'ble Court I look no account of the case under Section 498A of IPC pending in the Magistrate's Court at Howrah" This complaint was filed in 6th December, 1991 whereas the wife had lodged a diary on 4th of October, 1991 (Ext. 17, PB-II, p. 37), wherein she informed that she had no complaint against anybody and she would not start any case against anybody. In her written statement, she admitted that the proceeding under Section 498A IPC was still pending for disposal (PB-I, p. 53) and that the said proceeding was initiated when the acts of cruelty was perpetrated against her (PB-I, p. 55) and denied that the allegations made in the application under Section 498A were false and the case was filed falsely; but, however, she admitted that the matter was pending before the Court (PB-I, p. 59). 17. Making of false allegations are apparent on the face of the record that she wanted to say that the allegations made in the application were designed by her lawyer in one breath and then says that all the allegations made in the said application are true and correct; but these allegations are yet to be proved. No evidence has been led to prove any of these allegations by the wife. 18. Thus, it appears to be a false allegation in relation to the character of the husband imputing that the husband had been torturing the wife and that the husband used to have illicit connection with other women. These disgusting and disparaging allegations are sufficient to constitute cruelty when not proved and this cruelty was maintained even till the date when the wife had given her evidence in the proceedings. She kept the proceedings pending and stood by her submissions made therein. She had never resiled from the allegation made against the husband in Exhibit 10 filed on 16th December, 1991. Thus, the cruelty emanating from the materials, as discussed above, does exist and is apparent from the record itself, which we omitted to consider in the earlier judgment. Admittedly, the allegations made therein are false because of the reason that she had never attempted to prove the same apart from the fact that in the said application, she had alleged that this torture and the illicit relation was continuing for long namely immediately after her marriage, i.e. on 17th of June, 1982 in which one daughter and one son were born on 24th of July, 1983 and 20th February, 1988 respectively. Whereas a few days before 16th December, 1991, the date when the application under Section 498A IPC was filed, the wife lodged a diary on 4th of October, 1991 being Ext. 17 (PB-II, p. 37) wherein she did not whisper anything about those allegations, on the other hand, she said she had no complaint against anybody and she would not start any case against anybody. 19. Keeping of an application under Section 498A IPC pending against a person is like a Damocles sword. The person would remain in constant fear of its being fallen on his head any time. This itself is a cruelty continuous. 21. Even if it is assumed that the cruelty of the wife arising out of the initiation of the proceedings under Section 498A IPC and the allegation made therein was condoned by reason of the alleged cohabitation either before or after the institution of the suit, even then the failure to withdraw the proceedings despite agreed to by the wife, the survival of the proceedings, and her assertion in the written statement that the said proceeding is still pending disposal (PB-I, p.59), the assertion of the wife in her deposition in cross-examination that the said proceedings against the husband is now alive (PB-I, p. 141) and her deposition asserting that the statements made in the application under Section 498A IPC (Ext. 10) are all correct and true (PB-I. p. 138), has the effect of revival, continuance and survival of the cruelty. 22. It may be noted that even before this Court an application was made by the father for ensuring the studies of the son when the daughter had been adequately educated keeping her outside in Boarding School and the daughter lives with the father and that ultimately the wife was persuaded to allow the son to be admitted in a Boarding School outside the State of West Bengal. It is an admitted position that the son's education was interrupted so long the son lived with the wife. It is only after persuasion by us she had agreed to allow the child to have good education and the father had admitted him in a good school in terms of our order passed on 3rd of March, 2005. This interference with the child's education also constitutes a mental cruelty. 23. It is alleged that by reason of cohabitation the husband had condoned the act of cruelty on the part of the wife and all other grounds on which divorce was sought for. In our earlier judgment, we had held that in the absence of cross-examination on the question of cohabitation, the wife's allegations were to be believed. But, now it is pointed out that in his deposition the husband had asserted (PB-I, p. 91) that he had no relationship with the wife since 1990 and that he used to live in a separate room. He reiterated that he lived in a separate room in his examination-in-chief (PB-I p. 95) and that he did not maintain any relation with the wife since 1990 (PB-I, p. 96) and he did not condone the cruel behaviour of the wife (PB-I, p. 97). This he repeated at page 101 and maintained stood by in his cross- examination (PB-I, pp. 114, 118 & 121). On this question of cohabitation, the wife was cross-examined where she had stated (PB-I, p. 134) "that it is not a fact that I had no sexual relation with my husband since 1590." She admitted that she left the matrimonial home on 4th of October, 1991 by saying (PB-I, p. 134) " It is correct to say that from 4.10.91, I resided with my sister at Bally with my one son and one daughter." and said that (PB-I, p. 136)" I have been living in my matrimonial house since 1.10.92" She was also cross-examined on the question of co-habitation when she answered (PB-I, p. 137) that "it is a fact that my last cohabitation with husband was held on 1st week of January, 1995. At page 140 (PB-I), she stated in her cross-examination that "my husband does not reside in the house where I reside. Then says, I do not know as to where he resides. Not a fact that my husband did not live separately at any point of time in the premises where I reside in the same room." From the evidence of the OPW-I, the wife, it appears that she blew hot and cold when she says in her cross-examination at page 142 (PB-I) that "Not a fact that I suspected and used to tell that he had illicit connection with another lady" and that her lawyer drafted the petition and designed the same according to his estimation under Section 498A (PB-I, p. 141) and that she had no allegation against her husband on 4th of October, 1991 recorded in the diary (PB-I, p. 139) while saying that the statements made in the application under Section 498A were all correct and true. She contradicts herself to lose the credibility of her evidence. The suit was filed on 29th of November, 1994, whereas the last cohabitation was alleged in January 1995, which is wholly improbable. 24. The totality of the evidence of the wife clearly shows that she was not telling the truth and telling different things at different times. This eroded the reliability of her evidence. The credibility of the evidence does not depend on the absence of cross-examination, but on the credibility of the witness himself/herself and the totality of the evidence on record. It was so held in the decisions in Juwarsingh, 1980 (Supp) SCC 417 (supra) and P. Ram Ready, 1995(2) SCC 305 (supra). In the present case, however, there were some cross-examination and the wife admitted of not living in the same room and alleged cohabitation after fourth months of filing of the suit, it is the probability of the evidence, which has to be considered not the absence of cross-examination. Even in absence of cross-examination, the evidence is to be weighed with its value without attaching much importance on the absence of cross-examination. The truth of the evidence is to be tested on the basis of the probabilities and reliability and the credence of the respective witnesses, particularly, when two versions have been brought on record by the husband and the wife (PW-1 and the OPW-1). In the present case, the evidence of the wife seems to be against all probabilities. 25. At the same time, we have found that the parties are not residing together and had been living apart and the husband had left the matrimonial home. Even in course of hearing of the review application, the Court had attempted to resolve the dispute and requested the learned Counsel to bring about a settlement and ultimately to present the respective parties before the Court. The Court had attempted to settle the matter but the wife did not agree to reconcile though the husband expressed his willingness. The Court found that the parties are living separately and are unable to resolve their dispute and that the marriage has broken down irretrievably and ultimately a settlement only with regard to education of the son and the maintenance and residence of the wife was arrived at by consent of the parties without any success in bridging the relation between them. 26. Thus, it appears that the ground of cruelty exists and the marriage between the parties has irretrievably broken and all our attempts to restore the same had failed. As such it is a case fit for passing a decree of divorce even on the ground of irretrievably breaking down the matrimony on the principle we had enunciated in the decision in Nityananda Karmi v. Kum Kum Karmi, 2003(1) ICC 249 : 2003(1) WBLR (Cal) 348 : 2003(4) ILD 73 (Cal.). 27. Since by consent of parties the main appeal of which the review is allowed was argued at length between the parties and have since re-heard, in view of the fact that the ground of cruelty having been proved as discussed above and the marriage has irretrievably been broken and all our attempts to bridge this relation having failed by reason of the disagreement between the parties, we hereby allow the appeal in FA No. 12 of 2001 and grant a decree of divorce on the ground of cruelty and the Matrimonial Suit No. 318 of 1994 of the Court of the learned Additional Distract Judge, 4th Court, Howrah stands decreed. The marriage between the parties be annulled. Let a decree of divorce be granted accordingly. 28. The question of permanent alimony is hereby settled in terms of our order dated 3rd March, 2005 only with the modification that the husband shall arrange a proper flat in the locality of the matrimonial home sufficient for the residence of the wife since the husband submits that he does not have any share in the ancestral house. In addition to the maintenance, husband shall purchase a self-contained flat (at least with one bedroom with attached bath, one guestroom, drawing, dinning, kitchen, and common bath) in the locality sufficient to the requirement and status of the wife as close as possible to the ancestral home and shall fully furnish and make over the same to the wife within 6 (six) months from date and the wife shall be entitled to continue to reside in that flat till her life without any interruption from her husband or anyone else and she would continue to receive the permanent alimony in terms of the order dated 3rd of March, 2005 so long she survives in the same manner as provided therein. 29. In the result, the appeal stands allowed in terms of above. CAN 1120 of 2005 and CAN 3079 of 2005 are also disposed of accordingly. The judgment and decree appealed against is hereby set aside. The marriage between the parties stands annulled by a decree of divorce. Let there be a decree of divorce accordingly. The wife shall be entitled to residence and maintenance in terns of order dated 3rd March, 2005 subject to the modification as indicated in paragraph 28 above. The education of the son be governed in terms of the order dated 3rd March, 2005. The Matrimonial Suit No. 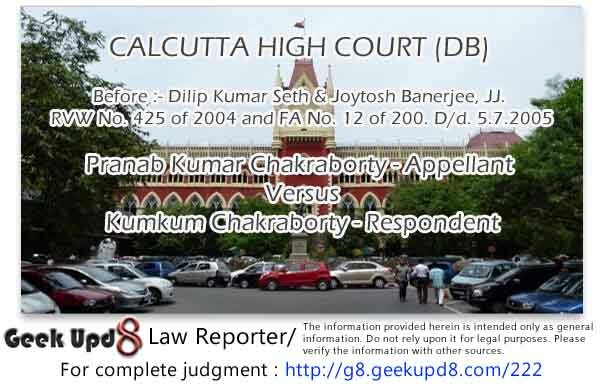 318 of 1994 of the 4th Court of Additional District Judge, Howrah is thus decreed. 30. There will, however, be no order as to costs. 32. Urgent xerox certified copy of this judgment, if applied for, the same be supplied within seven days on usual terms.